Why Would Ecuador Want Edward Snowden? : Parallels The country's president likes jabbing the U.S. The U.S. could put pressure on Ecuador if it grants asylum to Edward Snowden, though the country's oil reserves give it something of a buffer. 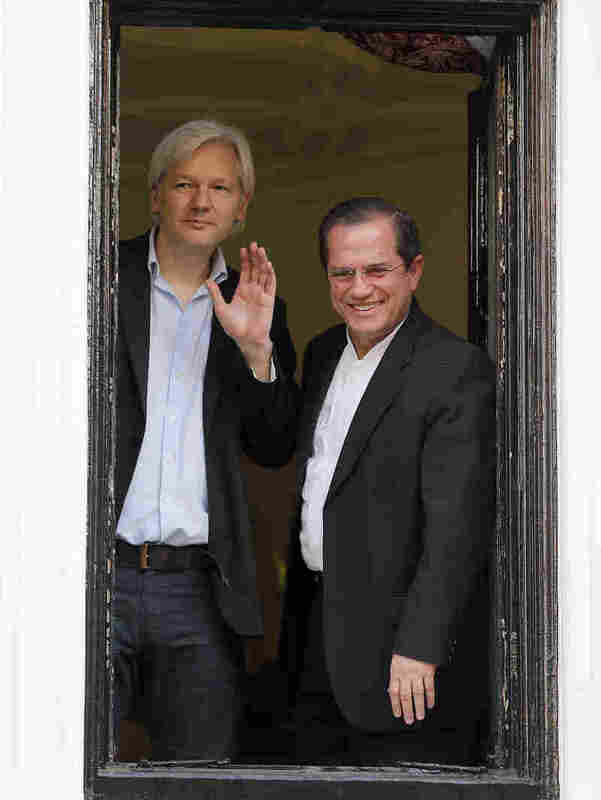 WikiLeaks founder Julian Assange (left) and Ecuadorian Foreign Minister Ricardo Patino appear on a window of the Ecuadorian Embassy in London on June 16. Assange has been living at the embassy for the past year. Patino announced Sunday that Ecuador would consider giving asylum to former NSA contractor Edward Snowden. Ecuador says it is considering Edward Snowden's request for asylum. This is the second high-profile case involving leaks of classified information, asylum and the South American country. WikiLeaks founder Julian Assange is holed up in the Ecuadorian Embassy in London, to prevent being extradited to Sweden where he is wanted for questioning over allegations of sexual assault. It's worth mentioning here that WikiLeaks in a statement Sunday said it is giving Snowden legal help. So why would the Andean nation consider giving refuge to Snowden, the former National Security Agency contractor accused of leaking classified surveillance information? "It becomes the center of attention. [Ecuador's] President Rafael Correa enjoys that," says Michael Shifter, president of the Inter-American Dialogue think tank in Washington, D.C. "He likes needling the U.S. This satisfies that impulse. It also gives them a sense of consistency and commitment to principles by linking it to the Assange case." Carl Meacham, director of the Americas Program at the Center for Strategic and International Studies, adds: "Correa is interested in inheriting the mantle of Hugo Chavez and Fidel Castro. To be able to do this with Julian Assange and Mr. Snowden puts him, in his view, as a protector of freedom of information." But, Shifter notes, Correa probably hopes that by granting refuge to Assange and considering asylum for Snowden he can shift the focus away from Ecuador's own record of press freedom. Human Rights Watch has criticized the country's new Communication Law, saying the measure "seriously undermines free speech." "To some extent, Correa can try and use this [incident] to point to the hypocrisy and double standards of everyone else who's coming down hard on him," Shifter says. As a small country, Ecuador could be vulnerable to U.S. pressure, though its oil gives it a buffer. Ecuador is the smallest member of the Organization of Petroleum Exporting Countries and one of the top sources of crude oil imports to the U.S. West Coast. It's also a beneficiary of the massive Chinese investment in South America. "There are going to be implications and consequences" to granting Snowden asylum, says Laura Powell, a research associate at the Council on Hemispheric Affairs in Washington. She adds: "Diplomacy is not going to get very far. The U.S. has to rely on trade sanctions" and similar measures to achieve its goals. Shifter of IAD says that at most the U.S. won't renew the Andean Trade Preference and Drug Eradication Act that covers Ecuador, Bolivia, Colombia and Peru; Ecuador would like that deal to continue. "But it's not going to be a fatal blow," he says. CSIS's Meacham doesn't see it that way. "It's pretty bad for them," he says. "Their trade benefits from the Andean Trade Preference and Drug Eradication Act are important. Forty-two percent of their goods are sold to the U.S. So on paper, it's not in their interest." Ecuador and the U.S. do have an extradition treaty, but as Meacham of CSIS notes: "Snowden is charged with espionage/treason, neither of which is covered by the extradition treaty."